Shaun Wane was in seventh heaven after Wigan booked a home semi-final in two weeks' time. Oliver Gildart's late try sealed a scrappy 13-6 win at rain-lashed Huddersfield to ensure their next two matches will be at the DW Stadium - against Hull FC next Friday and then a sudden-death play-off against Castleford the following week. 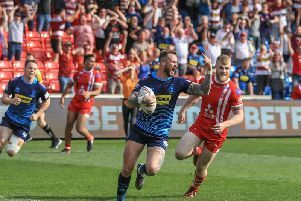 This was Wigan's seventh win in a row and, while the weather made it difficult for both sides, the coach was pleased to see their good run continue. Wane said: "We did what we needed to do. We've struggled here in the past and we struggled again. "But we showed some character. The atmosphere was terrible and the weather was shocking, but we ground out the win and we have that winning feeling. I'm just happy. "I wanted to get second spot, it was really important to us, and we've nailed it." Morgan Escare's first-half try helped Wigan into a 6-0 lead at half-time. And the Frenchman struck a drop-goal before Kruise Leeming's converted try created a nail-biting finish to a match littered with errors from both sides. Escare relished the extra involvement of a rare start, though Wane was clipped with his praise, singling out Joe Greenwood for his contributions. "Morgan went okay, he did some good things, there are things he can improve on," he said. "I thought Joe was good, he carried the ball well and he showed me that he can play in big games. "And I was pleased to see Ollie Partington, coming off the bench and going up against some big middles." Substitute Josh Woods was not used. "I was comfortable with the team I had on," added Wane. The Warriors' semi-final is expected to take place on Friday October 5, with St Helens hosting their knock-out game the night before. Huddersfield coach Simon Woolford said: "We didn't win but there's no shame." Wigan's Under-19s host Huddersfield at Orrell in a semi-final this Saturday, kick-off 2pm.